Heisler's Creative Stitchery: Dreaming of catching up! Can I ever catch up? That's my biggest dream right now. There always seems to be so much more for me to do. Between things that need done around the house, sewing, and all of the online stuff I'm so far behind it would take years and 10 of me to catch up. I'm still missing my sweet Spice but I have to admit I am having a less stress filled life and am able to get some things done. I started a website here at google. They are offering them in the lab. It's SO easy to use. No need to know how to write code. Can't wait until they're ready to fully launch. If they have less ads than yahoo, I'll be moving my business site over here. I'm going to use my pages for a doll gallery for now. I'm almost done with my newest pattern (finally!!!!). It has changed so much over the time I have been working on it. A few more pages of directions and it will be ready. Here's a few pictures. The first is not the cover shot but one I took. Meet Lovelorn Lena and her frog prince. I was so worried I couldn't design a frog as I have never even made one but I'm really pleased with him. This pattern will have more color pics to help you with the sewing than any of my other patterns. I'm also including a printed face. I'm printing the faces on muslin, sealing them so the ink won't run, and including 1 with each pattern! This makes doing the faces so easy. All you have to do is color or paint, like a coloring book. Hope to have her up for sale by next week when the cover pictures come in. Look for her at my eBay store and at the web store. 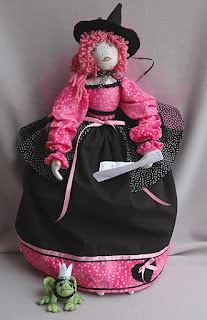 Also hope to have her at http://www.clothdollpatterns.com/ and http://www.dollmakersjourney.com/ . Both of these fantastic web sites sell some of my patterns! 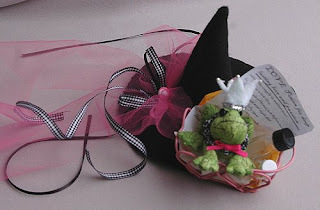 Right now in my eBay store you can find LeAnna and her frog prince. 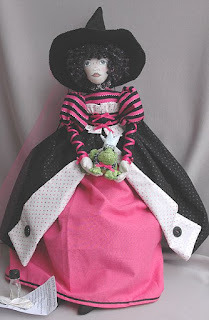 She was originally the second doll for this pattern. Rather than let her stay in pieces, I finished her. She has the same face and body but the hair and clothing are different. Here's a pic of her.